This is an extension from Friday’s blog which can be found here. Since the blog did well I thought I should continue my knowledge on Air Source Heat Pumps, simple supply and demand! Also if anyone has any more questions on Air source heat pumps then don’t be afraid to comment below and I will endeavour to get back to you with an answer, thank you my dear Sirs and Madams! Installing an air source heat pump? ASHPs look similar to air-conditioning units and are less disruptive to install than ground source heat pumps, as they do not require any digging in your garden so don’t fret, your Geraniums are safe! Air-to-water systems take heat from the outside air and feed it into your wet central heating system. As the heat produced is cooler than that from a conventional boiler, you may need to install larger radiators or underfloor heating in your home to make the most of it. Air-to-air systems take heat from the outside air and feed it into your home through fans. This type of system cannot produce hot water. In the summer, the ASHP can be operated in reverse, like an air-conditioning unit, to provide cool air for your home which is a helpful plus if I do say so myself. ASHPs can provide heating AND hot water. They require next to no maintenance. They can be used for air conditioning in the summer. 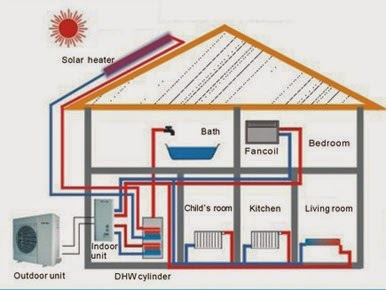 You need to use electricity to power the pump which circulates the liquid in the outside loop but, for every unit of electricity used by the pump, you get between two and three units of heat – making this an efficient way to heat a building. Cheaper Economy 7 electricity tariffs can be used to lower the cost of electricity to power the heat pump and special heat pump tariffs may be available from some electricity suppliers – alternatively consider solar photovoltaic panels or a wind turbine (if you are in a suitable area) for a greener source of electricity. 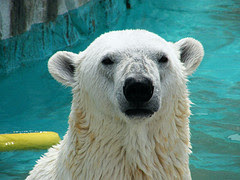 Their efficiency can be lower than ground source heat pumps. You’ll need enough space in your garden for the external condenser unit (comparable in size to an air-conditioning unit). Condenser units can be noisy and also blow out colder air to the immediate environment. You still need to use electricity to drive the pump, so an air source heat pump can’t be considered completely zero-carbon unless this is provided by a renewable source, such as solar power or a wind turbine. How green are air source heat pumps? An air source heat pump system can help to lower your carbon footprint as it uses a renewable, natural source of heat – air. The amount of CO2 you’ll save depends on the fuel you are replacing. For example, it will be higher if you are replacing electric heating than natural gas. who nicked all the ice? Economy tariffs are nothing new – Economy 7 (where your electricity switches to a cheaper tariff – usually between the hours of midnight and 7am) has been around for ages. If you’re home is heated by storage heaters, then you should already be on this (or a similar tariff). The idea is your storage heaters heat up overnight on the cheap tariff, leaving you with a semi-controlled heat output during the day. My rented property is on a economy 10 tariff – 5 hours in the early morning followed by two separate ‘booster’ periods during the afternoon and early evening. The only downside to such tariffs is the need for multiple meters, sometimes separate billing etc. So it makes sense to make the most of the cheap electricity – just like a company in America who took a novel approach to powering their air-conditioning in the recent heatwave. They’ve installed ice tanks which use the overnight cheap rate (and when there’s less load on the supply) to create 3,000 tons of ice (every night). 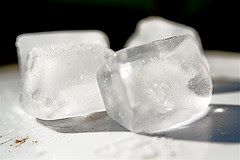 The ice is then used during the day to filter and cool the air going through the air-conditioning, reducing the working load on the air-con system and the suppliers. It sounds a bizarre approach but the company concerned reckon they’re saving around 35% in electricity costs. Could Air-Conditioning become a regular feature in UK homes? The NHIC (National Home Improvement Council) reckon air-conditioning systems could soon become an everyday feature as more homeowners discover the benefits of such a system. Air-conditioning units keep a constant flow of air moving through your home, helping eliminate damp problems, especially in older properties, by reducing condensation. In the long-term, this could reduce homeowners and landlords repair and redecoration bills. Already, installation companies are seeing a growing interest from the domestic market as more and more of us enjoy the health and comfort benefits of air-conditioning at work. And with this April being the hottest since records began, higher temperatures could be the norm. If that’s so, then a professionally installed air-conditioning system on your home could make all the difference. Where the system employs filters, hay fever sufferers will welcome the comfort without the need to open the windows. This story first appeared in our weekly homeowner email newsletter dated 4th July 2011. Click here to read the full newsletter. 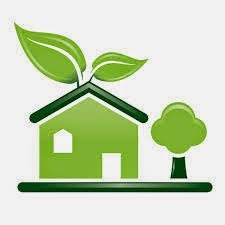 Author adminPosted on July 7, 2011 Categories air conditioning, condensation, damp problems1 Comment on Could Air-Conditioning become a regular feature in UK homes?